I grew up in the shadow of the Blue Water Bridge, when there was only one bridge. 830 feet to America across the river. I am Canadian by birth and fiercely Canadian by choice. 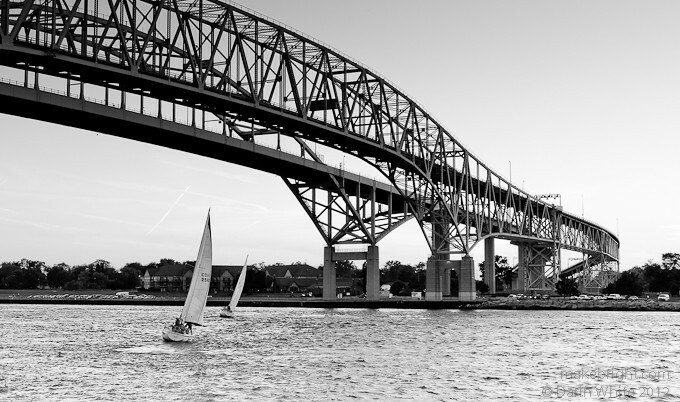 This entry was posted in photography and tagged 1shot, Canadian, Point Edward, St Clair River, water. Bookmark the permalink. Your looking down series is very interesting… in particular… “chillin” brothers, a shot not often taken by anyone. Also, the Waterloo sign and the photo explaining how you use the pole cam to achieve unique views are unique. Of course, all of the photos are the best. Keep up the great work! Have been there under that bridge by your side in 1987. Such a long time ago and now I can see you really happend to be an artist!!! Nice Blog, Darin.